Tee Bosustow, the elder son of UPA cofounder Stephen Bosustow, died today after a battle with cancer. Tee was a longtime champion of the UPA studio, and for many years he was at work on a feature-length documentary on the history of UPA, to be entitled “The Boing Heard round the World.” Further, he was an inspiration to younger generations of artists and historians. The book When Magoo Flew: The Rise and Fall of Animation Studio UPA could not have been written without his assistance and guidance. Stephen Housely Bosustow (known as “Tee”), the son of animator Stephen Reginald Bosustow and the former Audrey Stephenson, was born on February 18, 1938. The family called the younger Stephen “Stevie,” which his infant tongue rendered as “Tee Tee.” Thereafter, he was always known as “Tee,” both among friends and professionally. Tee attended Van Nuys High School and UCLA film school, where his classmates included Francis Ford Coppola. Tee later admitted, “I should have paid attention to what Francis was doing.” Tee pursued work as an editor, and he served for many years in the CBS news department. His editing credits include the Academy Award winner Is It Always Right to Be Right?, a 16mm film produced by his brother, Nick Bosustow, and their father. Tee was a longtime voting member of the Academy of Motion Picture Arts and Sciences. 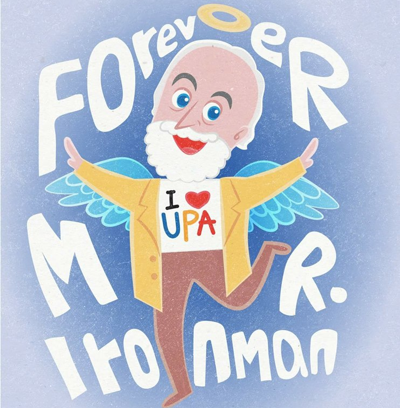 As early as the 1970s, Tee began preserving UPA history. He recorded audio interviews with his father, UPA cofounder David Hilberman, office secretary Maxine Davis, and others. At the time of his death, Tee was at work on his UPA documentary. The family plans to complete the film and to donate his animation collection to an archive, such as the Academy Museum, set to open in 2019. Tee Bosustow was married twice; the first marriage ended in divorce, the second in separation. He is survived by his second wife, Brigitte; their daughter, Sylvie; and his brother, Nick. The UPA-style image of Tee (above) is by Fenway Fan.